At approximately six miles in length (depending on whether you count the mostly off-limits section along Fort Point Channel), Dorchester Avenue is one of the longest streets in Boston, and as you might expect, it has a wide variety of restaurants along it, including some real hidden gems. 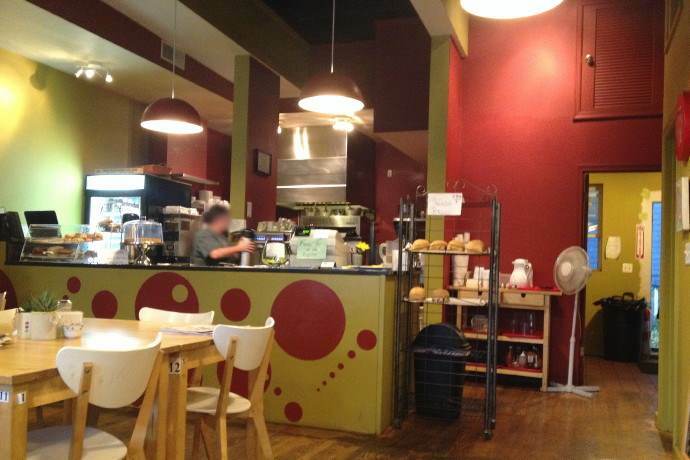 One such spot is a quirky little eatery between Peabody Square/Ashmont and Fields Corner (also known as St. Marks) called Dot 2 Dot Cafe, which can be pretty easy to miss, and is one of the relatively few breakfast places along this thoroughfare. Dot 2 Dot Cafe has a rather colorful storefront that would seem to make it stand out, but it gets a bit lost among the many retail places that line this section of Dot Ave. The fact that the street is often busy and fairly hectic doesn't help, either, which tends to make drivers look straight ahead with two hands on the wheel rather then take a peek or two at some of the shops in this neighborhood. The funky, artistic-feeling exterior certainly reflect the space itself, as the eatery has a lot of atmosphere inside thanks to a high ceiling with attractive hanging lights, pictures from local artists on the walls, an old-looking hardwood floor, and what looks to be a "play" area in the front with a bench. The clientele here is about as diverse as you'll find, with hipsters, blue-collar folks, large families, college students, retirees, and young couples all sharing the space. The menu at Dot 2 Dot Cafe may look rather basic, but the difference between this place and some of the more greasy spoon types is that everything here is scratch-made using top-quality ingredients. A few items on the menu include a fluffy omelet with fresh spinach and feta, vegetarian options such as scrambled tofu with roasted vegetables, thick and dense pancakes that come with real maple syrup (not a given in many breakfast places), a rich and moist brioche French toast that also comes with real syrup, house-made corned beef hash with herbs, onions, and grated potato rosti (which is basically a Swiss-style hash brown), a fish breakfast that consists of whitefish with sofrito sauce, eggs, and an option of grits, a plate of freshly-cut home fries that are nicely seasoned and cut into wedges, and for lunch, a variety of sandwiches as well as salads and flatbread pizza (a very early dinner is also offered on Thursdays and Fridays, with specials offered on those days). The coffee at Dot 2 Dot Cafe is very good, with tea, hot chocolate, and excellent fruit "mashes" also available. Copyright © 2013-2016, Boston's Hidden Restaurants (www.hiddenboston.com).